Meet the new Royal Enfield. From the moment you turn the key on and hit the starter button, you notice the change. No more special starting procedures. Just hit the button and let the all new Fuel Injection system do its job. The bike just sits there and idles, no more fiddiling with the choke. Twist the throttle open a little and the RPM's just rise without hesitation. Let off on the throttle and it drops right back down to a familiar sound, the classic Royal Enfield 'Thump-thump-thump' idle is still there. Click HERE to listen to the idle. Click HERE to listen to the motor rev. Once you click the bike into first gear, you notice the extra attention that was put into the transmission. No more mystery neutrals, no more missed shifts. Strong, positive engagement is what you get from the all new Unit Constructed Engine. Once you let the clutch out, the bike shoots forward and a nice breeze is blowing through your hair. Click it into second gear and twist the throttle. It's hard to wipe the big smile from your face now. Once you hit fifth gear, you realize that you are passing traffic and you fight the urge to look down and make sure you are still riding a Royal Enfield. 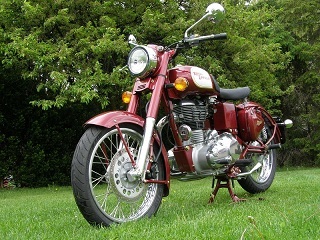 Welcome to the brand new Royal Enfield.